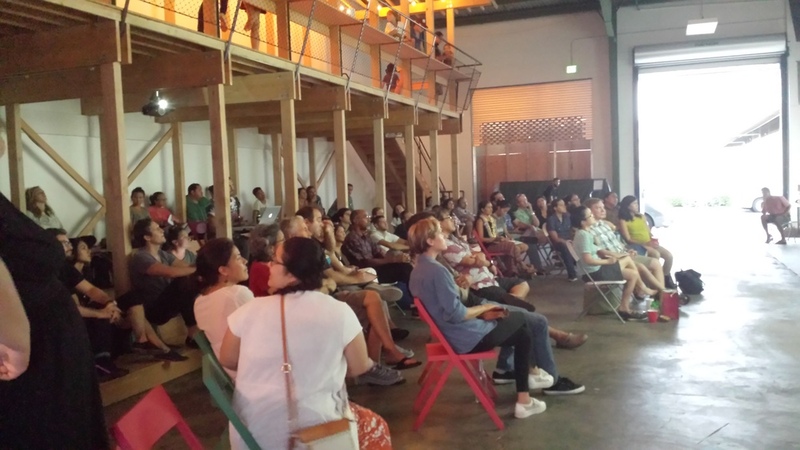 For its inaugural event, 88 Block Walks—in collaboration with The Value of Hawaiʻi II and the Honolulu Museum of Art—is pleased to present a discussion of streams in Hawai‘i. Led by Sean Connelly, Walk #1: ‘Streams,’ is an examination of Honolulu’s channelized stream network. Unbeknownst to many Honolulu residents, there is a stream that runs beneath Ward Warehouse and alongside the Farmers Market. This is only one of many cases of the urban environment systematically displacing a network of freshwater streams, springs, and ‘auwai. Yet, the water still flows from the mountains to the ocean in tunnels and ditches, hidden beneath roads and parking lots, between buildings and houses. Freshwater—our most valuable community resource—has become discarded, relegated to an ambiguous space. Can reclaiming our relationship with streams dramatically transform the way we live and value urban spaces? A brief introduction to Hawai‘i’s displaced freshwater network, including a virtual tour of the stream flowing underneath Kakaʻako, will be followed by a screening of Caroline Bâcle’s Lost Rivers at Kakaʻako Agora. The event will conclude with a panel discussion - moderated by Aiko Yamashiro - of the history and future of streams, especially in regard to the redevelopment of the Kakaʻako neighborhood. Lost Rivers is a portrait of “drainers” all over the world who explore the subterranean waterways in their cities in hopes of bringing them to the surface, both in terms of public access and ecological consciousness. The Value of Hawai‘i 2: Ancestral Roots, Oceanic Visions (UH Press, 2014) is a collection of essays and poetry that chart out alternative futures for Hawai‘i, grounded in community work and research happening in the present. The book offers wisdom, passion, and personal stories from both experienced and young leaders, all innovators in their fields, from O‘ahu, Hawai‘i Island, Maui, Lāna‘i, Moloka‘i, O‘ahu, Kaua‘i, and the Pacific. Our public programming is supported by The Center for Biographical Research and the Hawai‘i Council for the Humanities. Sean Connelly is an interdisciplinary designer with a background in architecture and urban design. He is currently researching Hawaiian resource management and the roles of land development in watershed rehabilitation and the future of an ahupua‘a-based urbanism at Harvard University. On August 29 his installation, Land Division, will open at the Honolulu Museum of Art.